There are people out there who think that being single is sad, depressing and something to avoid at all cost. I’ve known people who stay in unhappy relationships because they don’t want to be single again. If you ask me, that’s much worse than being single! Personally, I love being single. I love the freedom and independence that it affords me. I’m also the kind of person who needs alone time to relax and recharge. 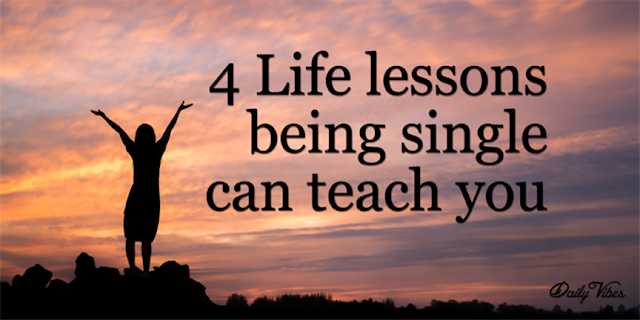 Being single is not a bad thing and can teach you a lot. Below are 4 life lessons that being single has taught me and can teach you! I’ve considered myself to be an independent person for the better part of my life. Being single has shown me how to be truly independent. Going to movies alone, eating out alone, sitting at the beach or taking a walk in the park by myself felt awkward at first. But, over time, I have learned to embrace my independence. Doing exactly what I want to do, when I want to do it, is a true feeling of freedom and independence that I never could have experienced while I was in a relationship. Being single has taught me to embrace and love being in my own company, and I have grown as a person because of it. Being single has made me more aware about who I am in regards to my personality, the people I want to associate with, the lifestyle I want to live and the things about myself that I need to improve. When I make a mistake, for instance, I don’t have someone who will immediately tell me it’s okay. I have to be aware of what I did wrong and understand how I can improve and do better in the future. In regards to friendships, I have to evaluate the new people in my life on my own and decide if I want to associate with them or not. When I was in a relationship, I always had “him” as backup. Now I can only rely on myself to ensure what’s best for me. Being single has made me more self-aware than I have ever been. One of the most important things I have learned is that I am all I need. I am the only person who can make me happy. I am the only person who knows what’s best for me. I don’t need a date in order to go out and enjoy a good meal. I don’t need someone around to validate what I am doing and why I’m doing it. If I make a mistake, I learn from it, move on, and do things differently next time, rather than depending on someone to “fix it.” I’ve learned that I am all I need to take care of myself and live a happy life. I’ve heard it said that once you are happy with who you are, you will attract someone similar. I believe this is true. Being single has helped me understand myself better, which, in turn, makes me want to find someone who truly knows himself and has his life together. I’m able to take care of myself, and I have learned that I need someone who can do the same. es, there are times when I feel like the loneliest person in the universe. But, most of the time I feel like I’m on top of the world knowing that I’ve achieved so much on my own. I really couldn’t wish for anything else.